With the improvement of people’s aesthetic, Metallic texture is getting more and more popular, but the cost is higher, limited the use of some everyday applications. Plastic is light and some performance can meet some of the applications of everyday items, but people may feel the plastic surface texture is not beautiful, it looks cheap. So how can you make plastic surface metallic process ? Below is a few kinds of plastic surface metalizing processing technology from what we suggest in our working experience. First, let us come together to understand what is plastic surface metallic process, and share more these knowledge to our global customers, learning and improve ourselves all the time. What is plastic surface metallic process? In simple terms , it’s to cover the plastic surface with metal. Plastic surface metallic process is popular in electronic, automobile, household goods and other industries. 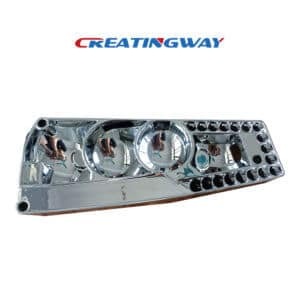 As a professional CNC machining manufacturer, Creatingway followed several methods to support our global customer this kind of project request. Below are some solutions used often. Electroless plating is the most widely used processing method currently, the technology for its process is simple, energy conservation and environmental protection. The applicable material is wide and can be deposited coating on metal, non-metal and organic matter. For this way, corrosion resistance and service life of the product can be improved a lot. Plastic electroplating application is becoming more and more extensive, it’s one of the important process of surface decoration in the plastic products. The most widely used material is ABS and plating effect is best, followed by PP. Also other material like nylon, polypropylene, polycarbonate, polystyrene, etc, but it’s more difficult and less use. This process is applied to coat with metal powder on plastic surface such as silver, copper, nickel and aluminum, etc. Many electronic products especially cell phone, uses a metallic paint for their plastic back cover, thus you can see the plastic surface metallic. Other method like Metal Spraying, Metal powder composite, PVD, CVD are also the option for plastic parts surface. Consider to your budget, performance and purpose, you can choose the one you prefer and we can be a help here. In short, if you want metallic surface but less cost on the material and CNC machining project, to use plastic with surface metalizing is a good choice. Creatingway will be glad to join in any of your prototype and low-volume production with competitive price and short lead time.